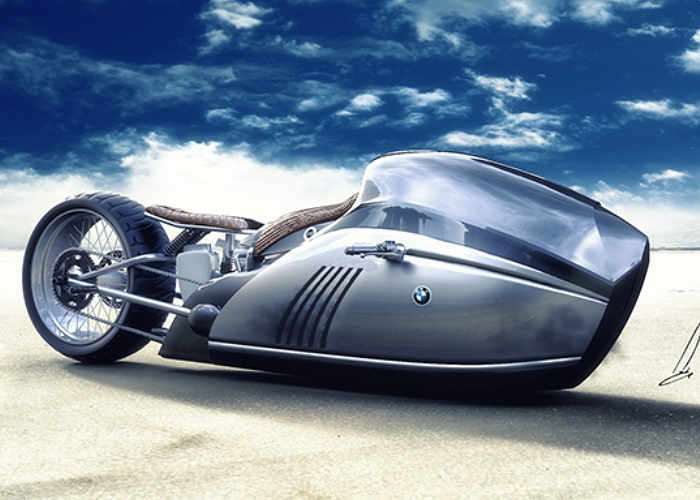 A futuristic bike concept has been created by designer Mehmet Doruk Erdem in the form of the BMW ALPHA Concept, which has been published to the Behance website in the form of a range of concept images. Unfortunately unofficial concepts rarely become production vehicles but the BMW K75 Alpha Motorcycle is an exception end has become a reality Erdem teamed with bike builder Mark “Makr” Atkinson. The BMW ALPHA has now been equipped with a a turbo, reworked shifter, new brakes, steering components, and an entirely new frame and has brought to to life the original Salt Flats racer by designer Mehmet Doruk Erdem, ready to ride. Unfortunately no information on pricing for the concept has been released as yet, but as soon as information comes to light we will keep you updated as always.